Pumice is a textural term for a volcanic rock that is a solidified frothy lava typically created when super-heated, highly pressurized rock is violently ejected from a volcano. This unusual igneous rock formation is due to the simultaneous actions of rapid cooling and rapid depressurization. The depressurization creates bubbles by lowering the boiling point of the lava (akin to the bubble-creation when a carbonated drink is opened). The simultaneous cooling then freezes the bubbles in the matrix. Pumice is composed of highly microvesicular glass pyroclastic with very thin, translucent bubble walls of extrusive igneous rock. It is commonly, but not exclusively of silicic or felsic to intermediate in composition (e.g., rhyolitic, dacitic, andesite, pantellerite, phonolite, trachyte), but basaltic and other compositions are known. 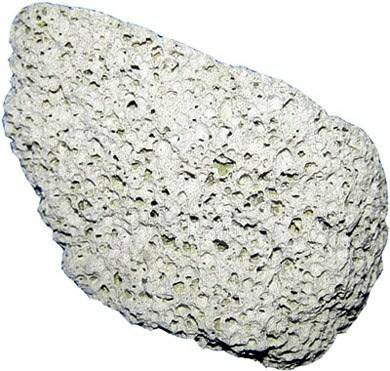 Pumice is commonly pale in color, ranging from white, cream, blue or grey, to green-brown or black. It forms when gases exsolving from viscous magma nucleate bubbles which cannot readily decouple from the viscous magma prior to chilling to glass. Pumice is a common product of explosive eruptions (plinian and ignimbrite-forming) and commonly forms zones in upper parts of silicic lavas. Pumice has an average porosity of 90%, and initially floats on water. Scoria differs from pumice in being denser, with larger vesicles and thicker vesicle walls; it sinks rapidly. The difference is the result of the lower viscosity of the magma that formed scoria. 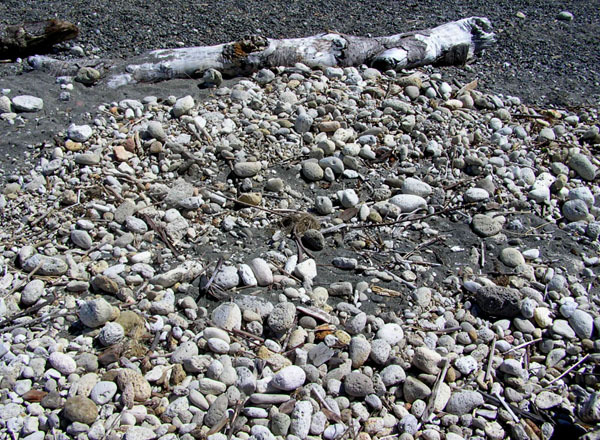 When larger amounts of gas are present, the result is a finer-grained variety of pumice known as pumicite. Pumice is considered a glass because it has no crystal structure. 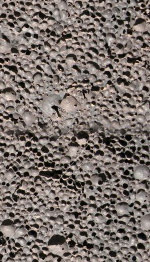 Pumice varies in density according to the thickness of the solid material between the bubbles; many samples float in water. After the explosion of Krakatoa, rafts of pumice drifted through the Pacific Ocean for up to 20 years, with tree trunks floating among them. 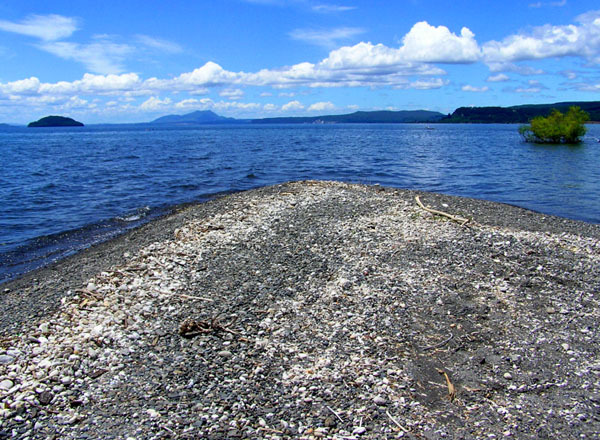 In fact, pumice rafts disperse and support several marine species. In 1979, 1984 and 2006, underwater volcanic eruptions near Tonga created large pumice rafts, some as large as 30 km that floated hundreds of miles to Fiji. 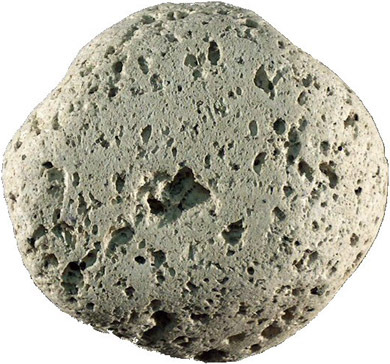 Pumice is widely used to make lightweight concrete or insulative low-density breeze blocks. When used as an additive for cement, a fine-grained version of pumice called pozzolan is mixed with lime to form a light-weight, smooth, plaster-like concrete. This form of concrete was used as far back as Roman times. It is also used as an abrasive, especially in polishes, pencil erasers, cosmetic exfoliants, and to produce stone-washed jeans. "Pumice stones" are often used in beauty salons during the pedicure process to remove dry and excess skin from the bottom of the foot as well as calluses. Finely ground pumice is added to some toothpastes and heavy-duty hand cleaners (such as Lava soap) as a mild abrasive. 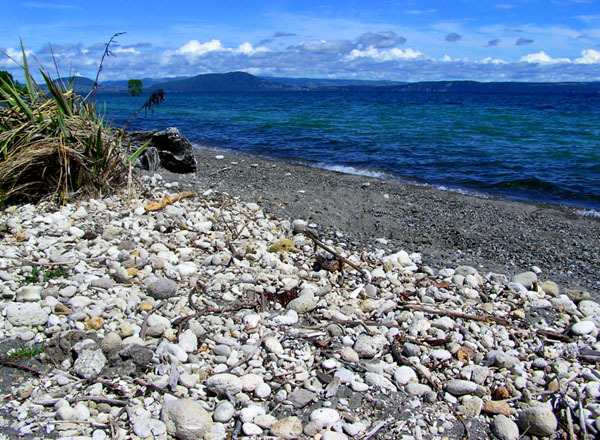 This earthcache will take you to a river mouth on Lake Taupo where you will be able to find pumice rocks of various sizes. As part of the logging requirements for this earthcache you will need to perform an experiment in order to determine the density of a piece of pumice rock. 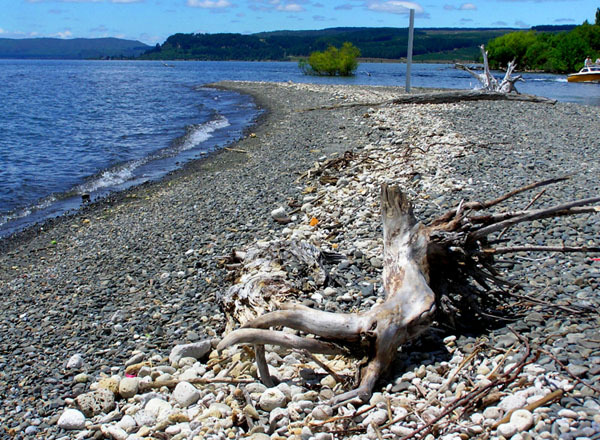 There is usually plenty of pumice in this area as it washes down the river into the lake and is deposited around the river mouth and up the lakeside to the north/east. 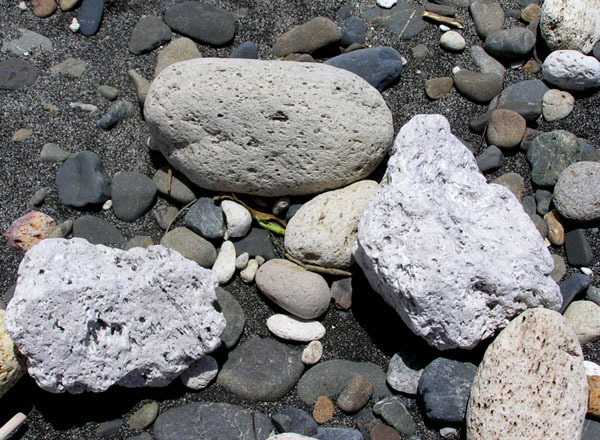 You may need to take a stroll up or down the beach to find a sample of pumice just the right size for the experiment. 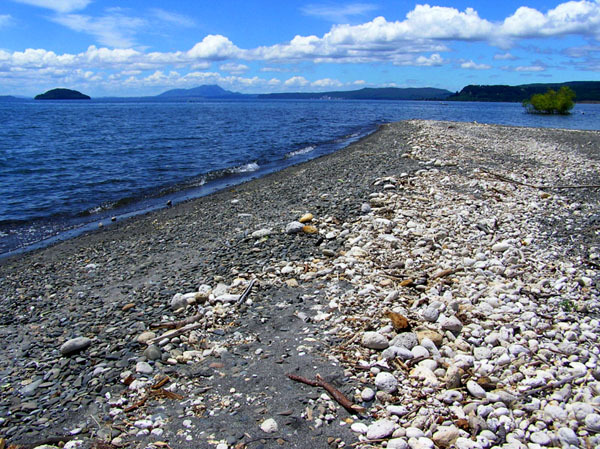 There is also plenty of pumice on the east side of the river mouth, which can be accessed through a reserve from Ani Miria Place (see Additional Waypoints). - To perform the following experiment on the pumice rock sample you find. This experiment can, and should, be undertaken at the beach (you can use lake water), but this is not compulsory. 1. Fill the measuring jug with water to about half, but preferably up to exactly one of the major markings of the measuring jug. If the jug is 1L then the suggested quantity of water to add is 500mL. Note down the water level in the jug (in mL) - this is amount A. 2. Float the piece of pumice rock in the jug and note down the new water level (in mL) - this is amount B. Because the pumice is now floating, the difference between A and B gives you the amount of water displaced by the pumice and therefore, knowing that the density of water is 1kg/L, the mass of the pumice. 3. So subtract A from B and this gives amount C which is both the volume of water displaced, in milli-litres (mL), and the mass, in grams, of the pumice sample. 4. Next, use your finger to completely submerge the pumice rock in the water in the measuring jug. Be careful to only just submerge it - don't push it so far into the water that your finger is also in the water (see the example picture) as you only want to measure the volume of the pumice, not your finger. Note down the new water level (in mL) - this is amount D. This allows you to calculate the total volume of the pumice sample and further allows you to calculate the density. 5. So subtract A from D and this gives amount E which is the total volume of water displaced, in millilitres (mL) by fully submerging the pumice stone, equalling the volume of the pumice rock itself. Since density is calculated as mass divided by volume, divide value C by value E to give F which is the density of the pumice rock, in kg/L. 1. Conduct the experiment listed above. 2. Contact the cache owner and provide the values of A, B, C, D, E and F. Do not publish these in your online log. a. Yourself and your GPS at or near the published coordinates, with the spit, the river mouth and the lake in the background. b. Your pumice stone sample and measuring jug used for the experiment. When you have visited the published coordinates, completed the experiment and contacted the cache owner with the required answers you can go ahead and log the find and upload the required photos - no need to wait for confirmation. However, if you do not provide the required information or fail to upload the required photos then your online log will be deleted. No email with answers or no photos with log = no find.